It’s no secret that I am an old sign fanatic. I just find the look enticing, and totally fits in with any season. 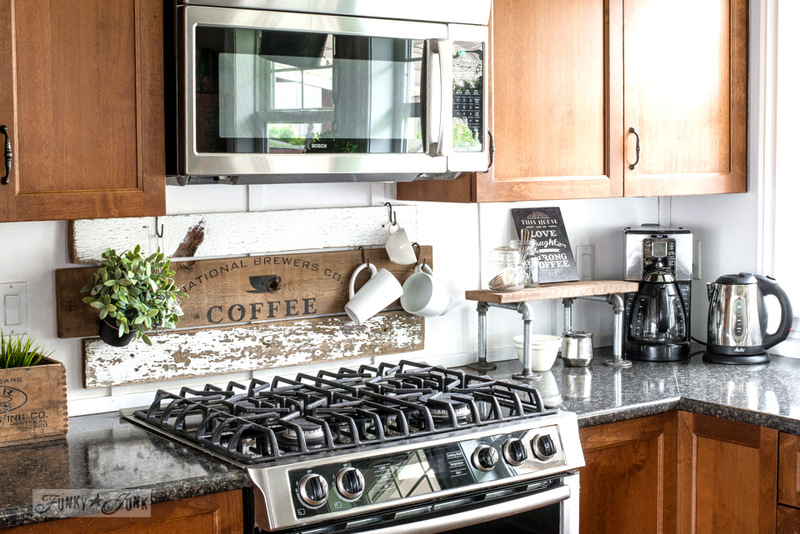 One place I really love to do something special with is behind my kitchen stove. This Bakery sign stood the test of time for an entire year. A YEAR! Can you believe I left ANYTHING up for one whole year?! Well, that just doesn’t cut it for a decorator type! 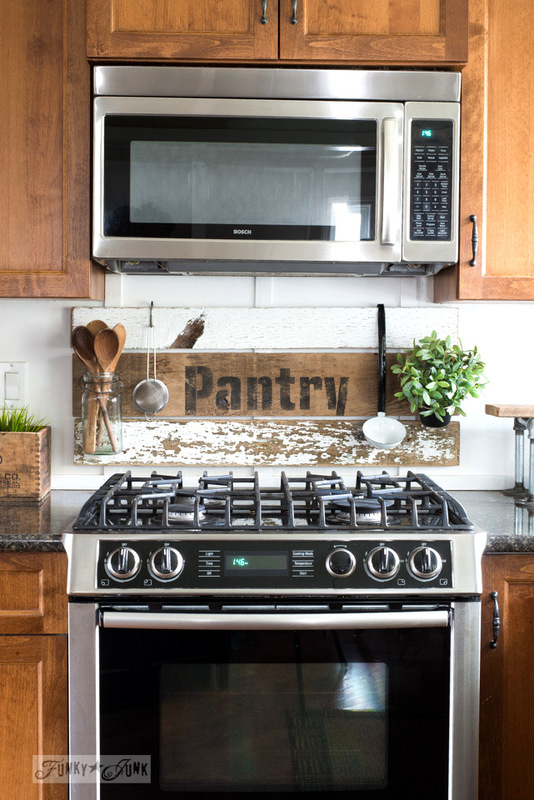 So right after Christmas, I made myself pull it down, gave the backsplash a fresh coat of white paint, and let it stay that way. Bare. For 3 months. 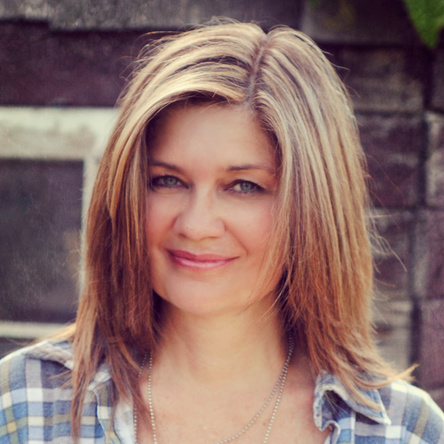 When I was finally ready to do something new… I couldn’t decide on a new theme. 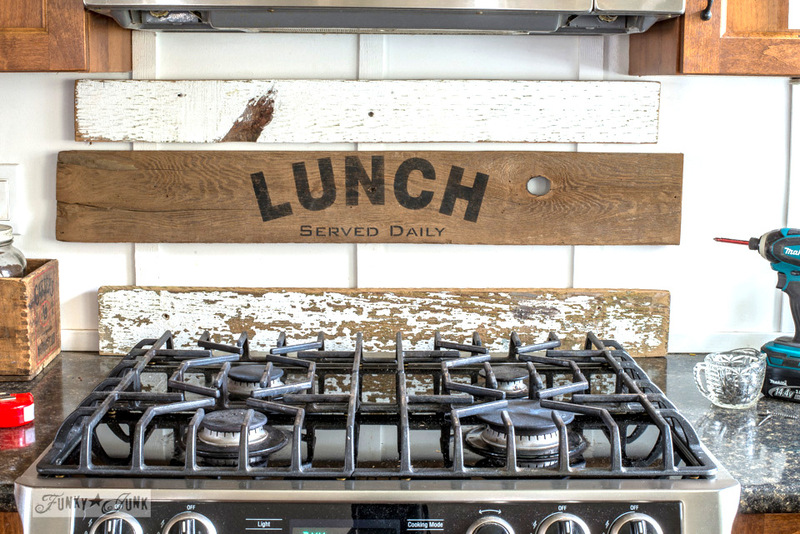 But this reclaimed wood heart project changed all that. 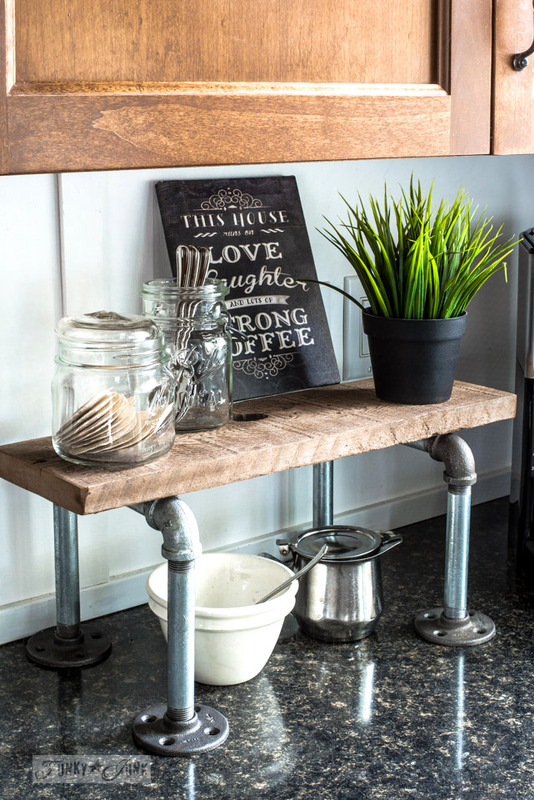 I didn’t have room to place this coffee mug holder in my kitchen, but I LOVED the pieced together scrap wood treatment. So I set about trying to come up with a way for the look to fit my designated space. Now, allow me to give you the 5 cent tour of the kitchen so you can see my wall space dilemma. There isn’t much of it in this kitchen. As in none. I chose 3 windows instead. 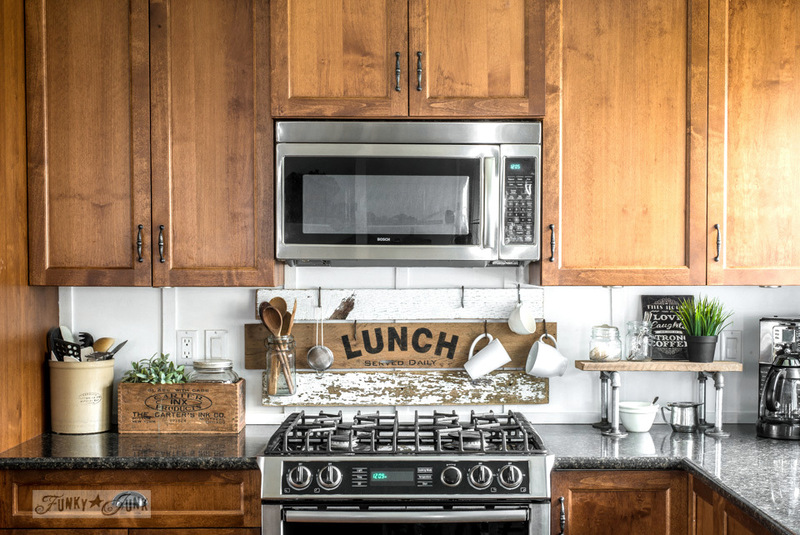 The kitchen can become dark with all the wood and black accents, so I like choosing minimal accessories that are lighter in tone and scale if possible. For that reason, the walls went WHITE WHITE! Right outa the can. Things in layers really help to save space too, such as this little pipe coffee station, as well as my pipe shelf phone station. 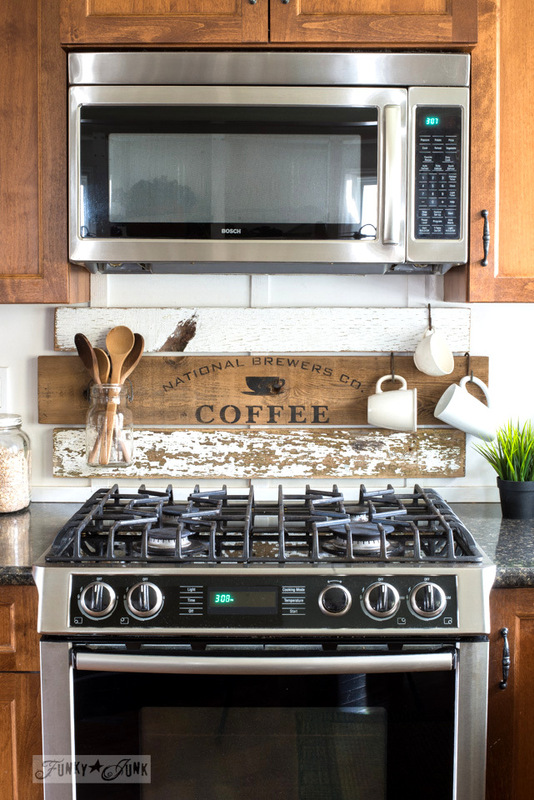 So for me, behind the stove is prime real estate for decor AND function. It’s all I have left. And this is what I ended up doing. Fun! 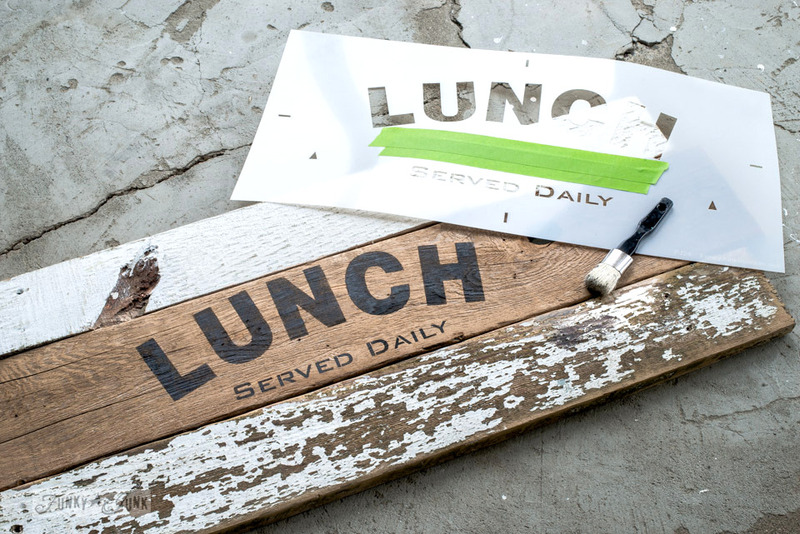 This lunch sign is just the right amount of wood, but not too heavy, thanks to the white wood mix. And it functions well as a mug holder for my precious AM brew, and even provides a little storage for my wooden spoons. But that isn’t all. What this sign ultimately does after the fact will make it an absolute breeze to change themes next time I’m so inlined! Year schmeer. I can now change it out in 30 seconds! My kinda DIY! 1. Gather up 3 boards of choice. This really can be a combo of anything you like. I chose a woodsy one in the centre, because I really love stencilling crate looking markings on wood tones, plus it adds visual weight to just the middle. 2. Cut to desired size, then lightly sand surfaces and edges. 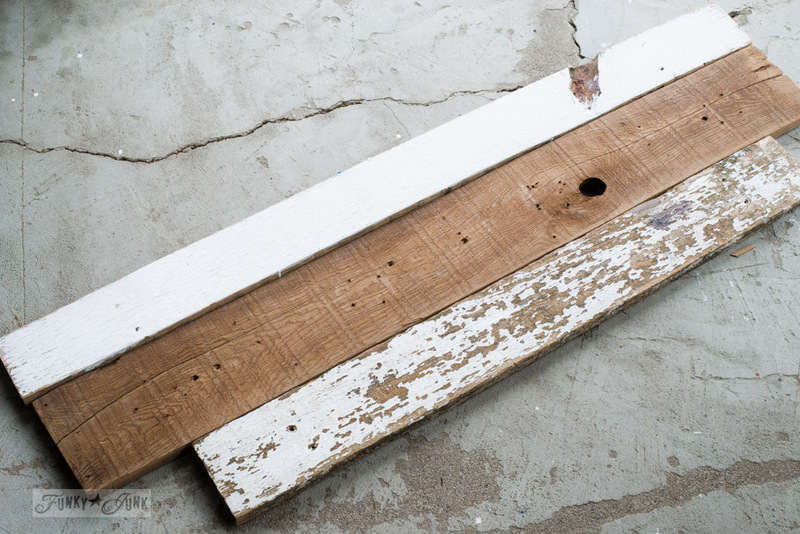 For a true scrap wood look, try 3 different lengths! Or cut them all the same. 3. 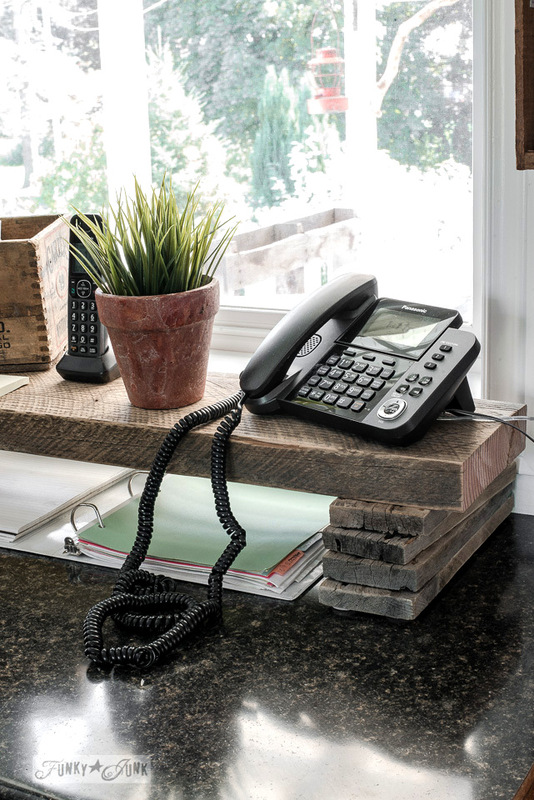 Decide on the messages you wish the middle board to showcase, ensuring they fit. This is the very best part of this entire project. I got 3 signs out of the time it took to pretty much make one. 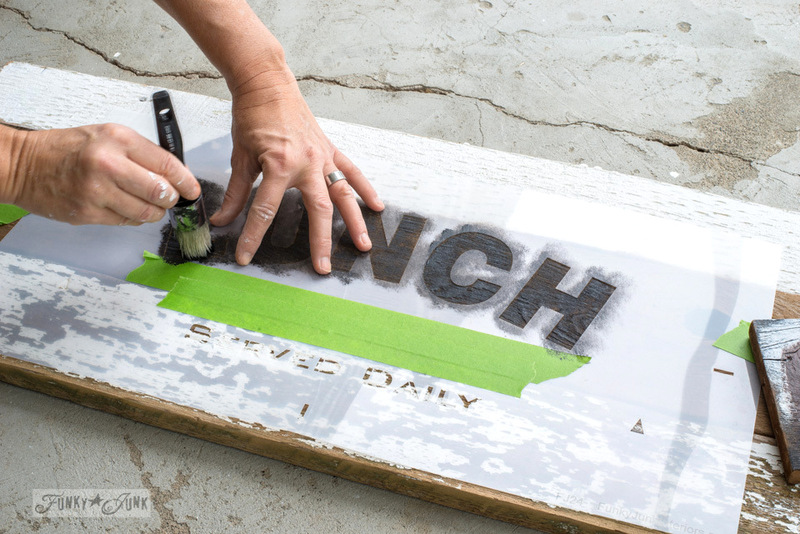 Stencil tip: I often tape off sections of stencils to create the messages desired. 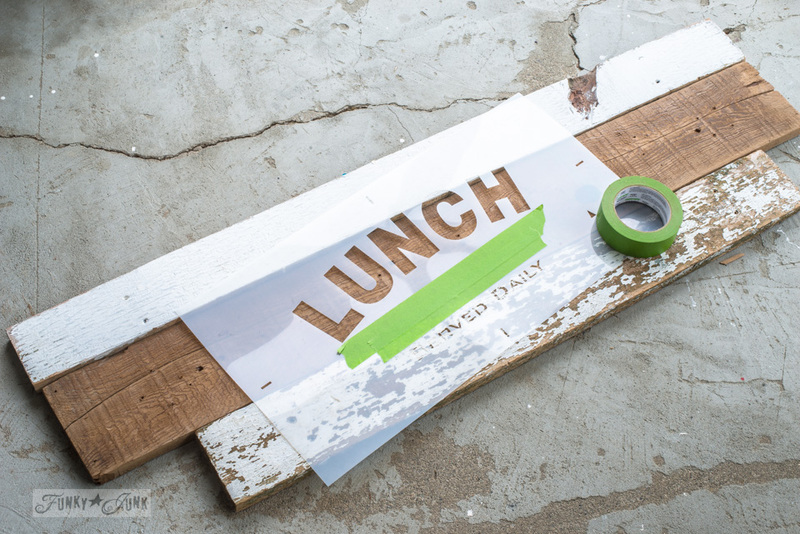 Taping off is a precaution, so you don’t accidentally stencil through those areas. 4. 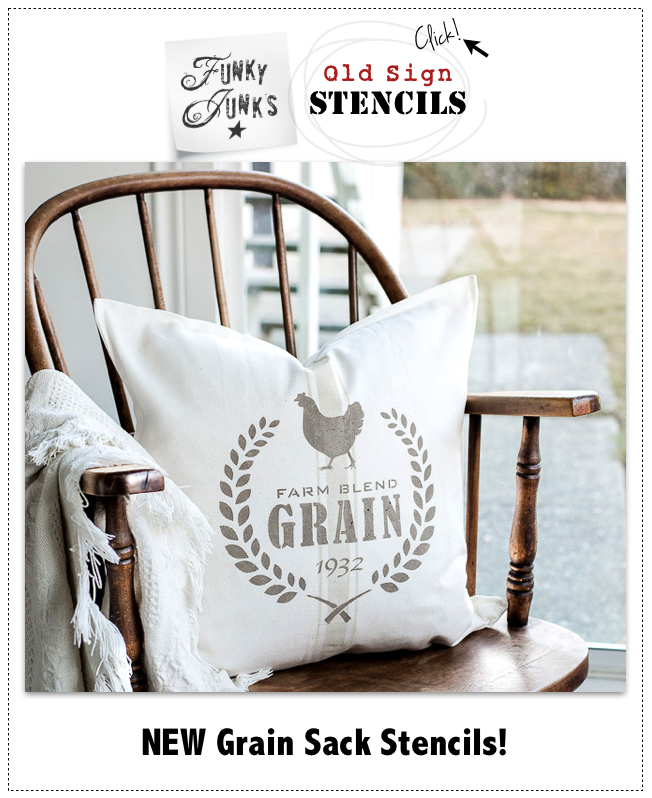 Stencil on your designs. Everything – Learn ALL ABOUT STENCILLING, including my chosen gear, how to clean, what to make, etc. In a nutshell, the drier your brush, the cleaner your images will turn out. I used Fusion Mineral Paint’s coal black, my go to for crate looking designs. 5. 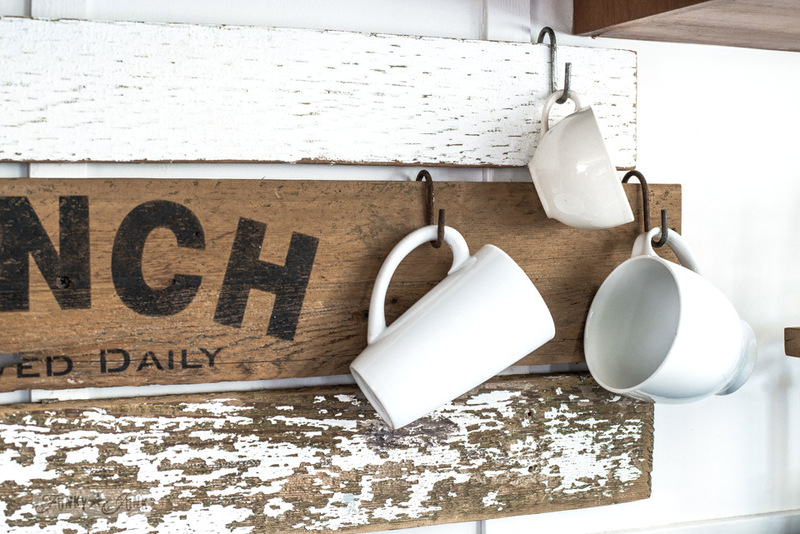 Mount the boards to your desired location by screwing them directly onto the wall. Caution: Attach wood behind your gas stove at your own risk. I place a metal cookie sheet in front of it when cooking. Wood stays cool to the touch. Or use idea in a different area. 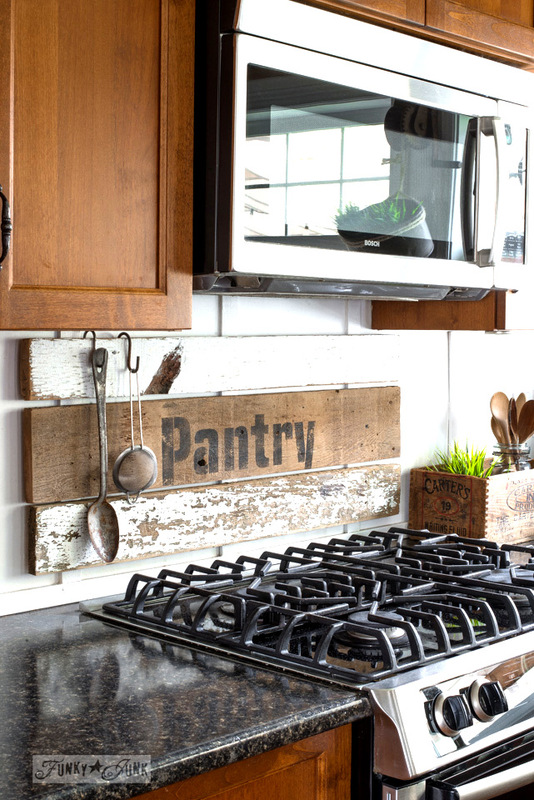 Gap Tip: I have a board and batten wall treatment, which creates a little space behind the boards, perfect for using S hooks to hang stuff. If you wish for similar, assemble your boards together from the back first spaced WITH gaps before installing onto the wall. And then… goodness. This photo shoot took all day long, because it was so fun to change the sign! I mean, where do you even stop and just call it a day?! p.s. I ate breakfast at about 4 pm. Tells you all you need to know. A good solid coffee sign will always win in my book! Seasonless, and fun to look at! There are actually two coffee stencils (to date) to choose from. 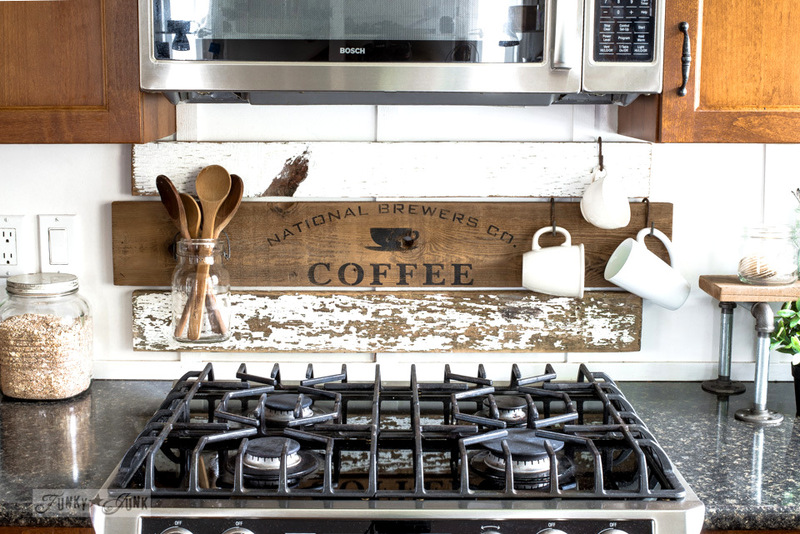 Tell me this doesn’t have you wanting to brew coffee 24/7… the struggle is real. This is the setup that I ultimately left up. For now. LOVE it! Simple, yet super useful for my coffee cup stash and wooden spoons at the ready for cooking needs. And really easy to remove the jar, replacing it with a metal cookie sheet during cooking. 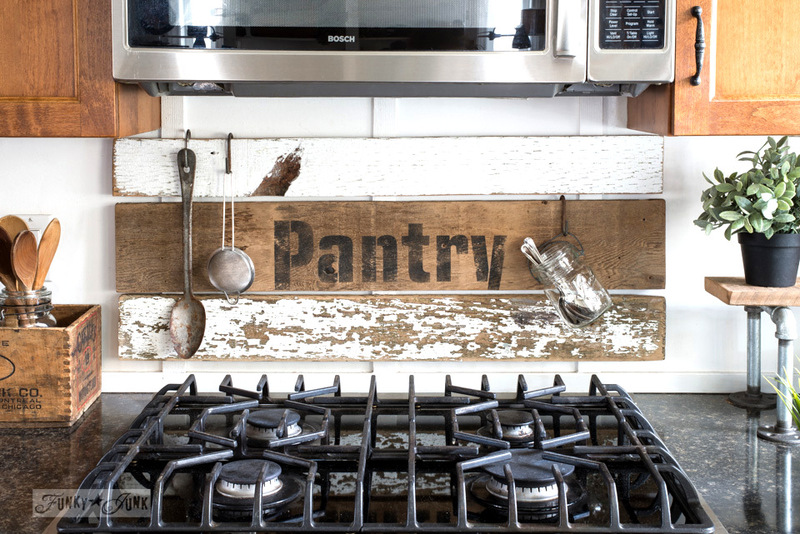 This pantry sign showcases all the same sized boards for a truer sign look. Fun fact… I stole this sign from this PANTRY SHELF. Sign, sign, everywhere a sign in these parts. See what I mean? So! Many! Options! And they all work well. So there you have it. 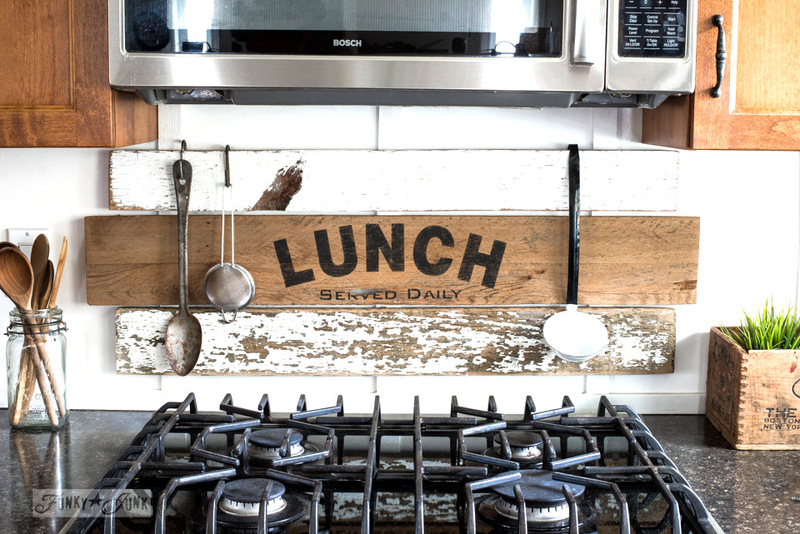 An interchangeable kitchen sign so I now have no excuse on deciding what to hang up. Just change the message, season or theme depending! I could see this working anywhere you need to hang something. Coats, bathroom towels, changing area in a bedroom. The additional boards really add some weight to an otherwise very simple sign. Now… back to my regularly scheduled messy kitchen state… it’s time to eat and brew coffee after all. But the spotless kitchen was super fun to have for nearly an entire DAY. Have I inspired you to try an interchangeable sign next round? I’ve been so looking forward to seeing this (after sneak peeks on social media). I’m in love!! Even better than I could have expected. Love it, D! 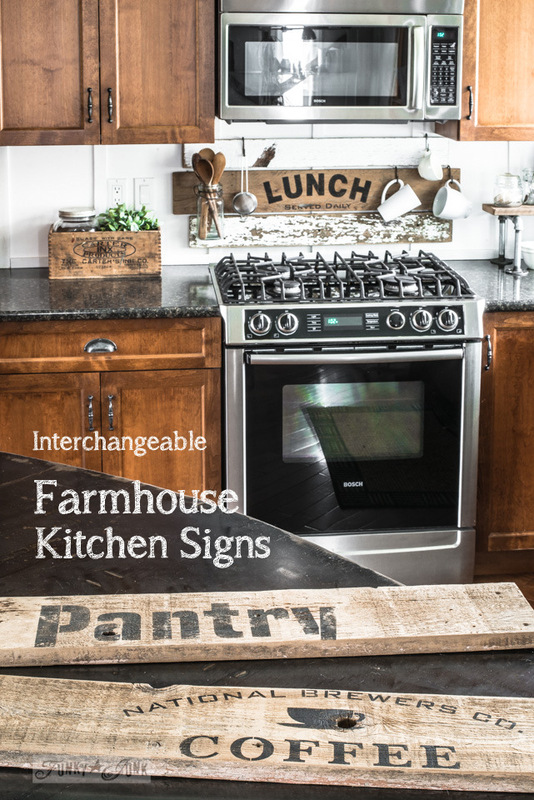 Love the interchange concept and I really like your kitchen. The island on an angle is fantastic. With the farm up for sale I guess I’ll just keep dreaming about the future and all the fun things I plan to incorporate. I do love the configuration of the kitchen. It’s different! The hardwood floor also angles with the island just in the kitchen area, adding a little more definition. I cannot WAIT to see how your new place comes together! what a fun idea! 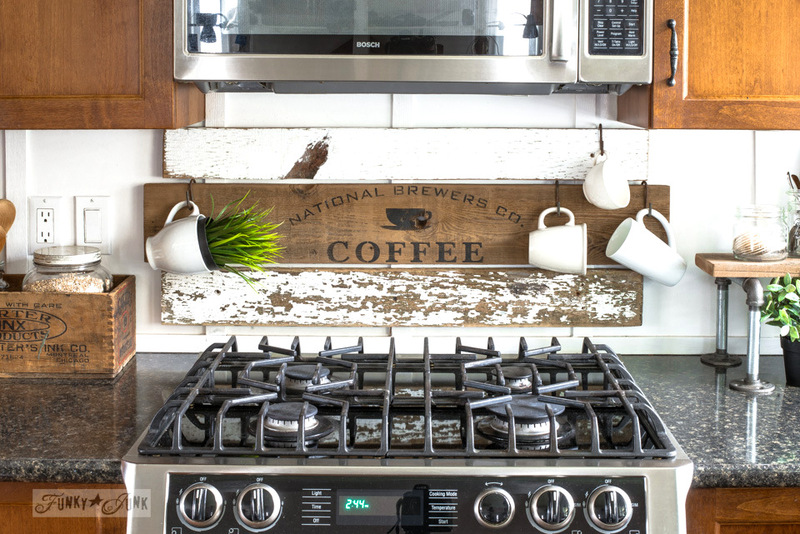 great at home & for a business like the coffee shop you frequent. love the white piece of wood with the dark. 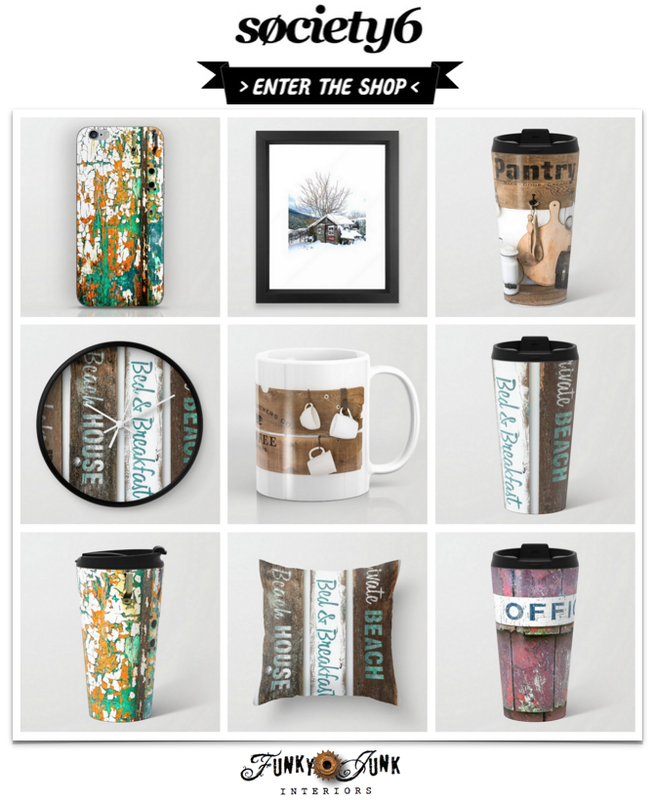 which of the coffee stencils is the most popular? I have the one you used, but the other one is also super cute! National Coffee is one of the top performers, (slips JUST under Farmers’ Market which is #1) but I think lots of that is due to it being one of the first to be launched. Ok, maybe design too. 🙂 It’s designed after an antique coffee crate. 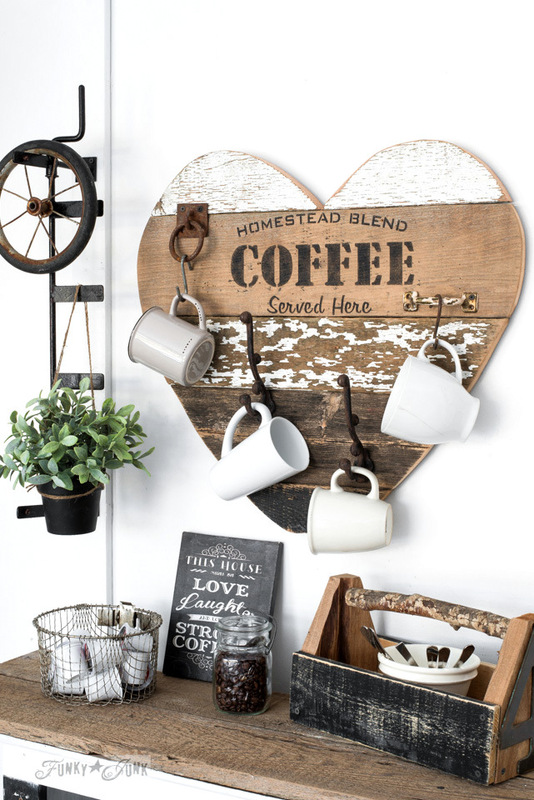 Homestead Coffee was designed in a more condensed format, so it would fit smaller areas. You’ll find it handy if you have found National a little too wide. For this reason, the word COFFEE is bolder so it stands out. I absolutely love this idea! I have a separate pantry area…my house was built in 1892. 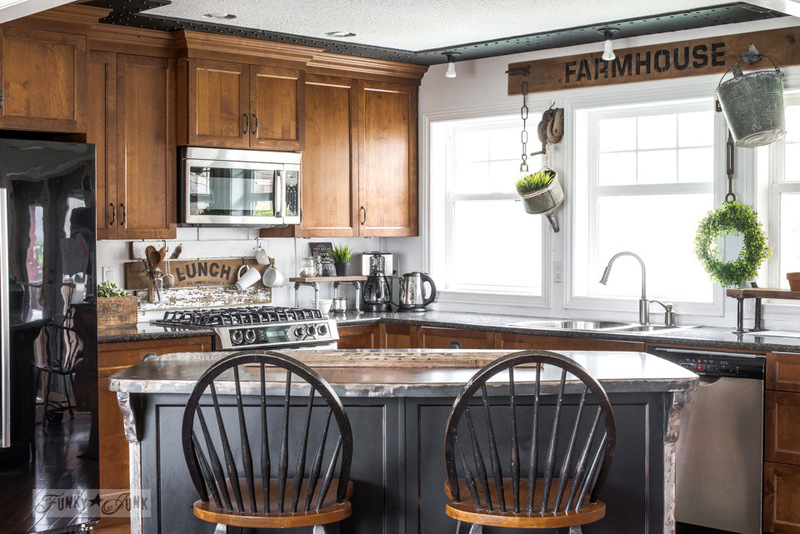 It’s an old victorian house but I love the farmhouse look. 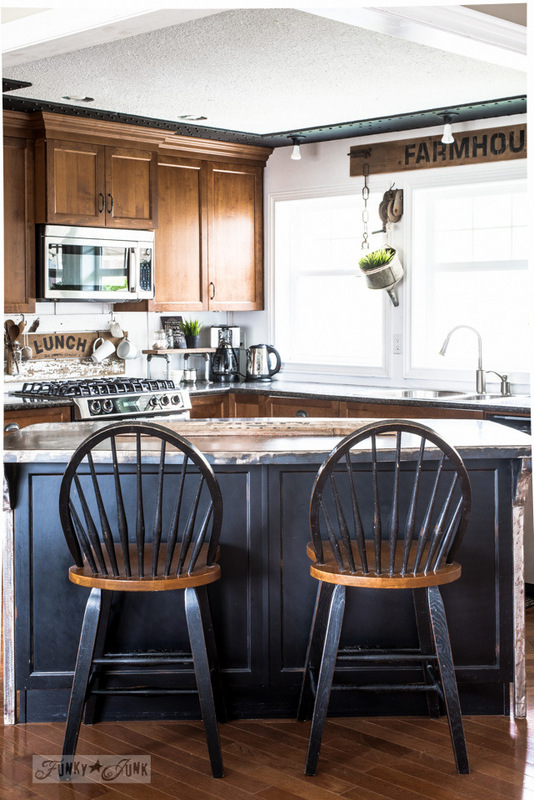 I am s-l-o-w-l-y changing my kitchen around to the farmhouse look…(against my husbands wishes–but he’s liking what I’m doing). What a great post! 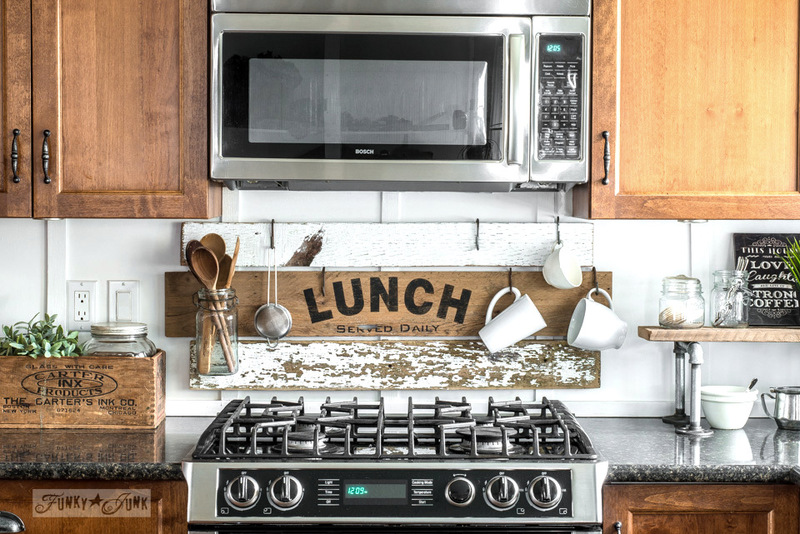 Love your kitchen and the interchangeable signs. 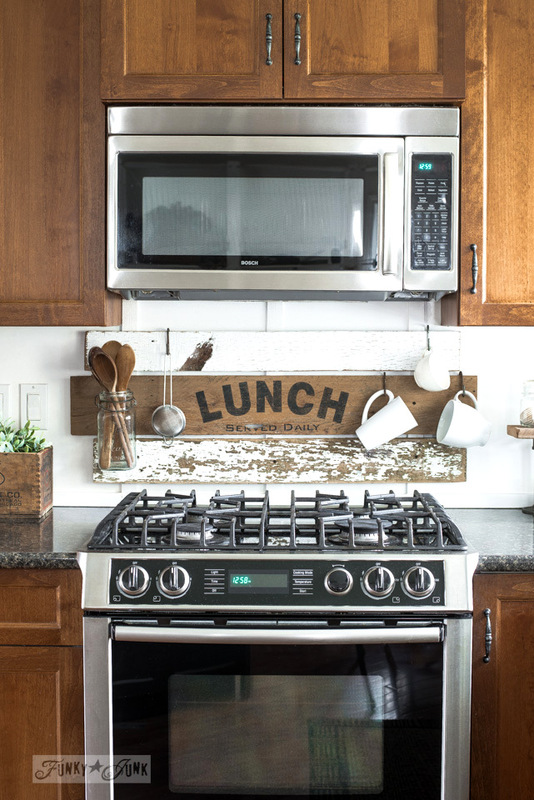 With tile everythere in our kitchen would need to find another place for signs. Thank you for sharing. Love the interchangeable signs. 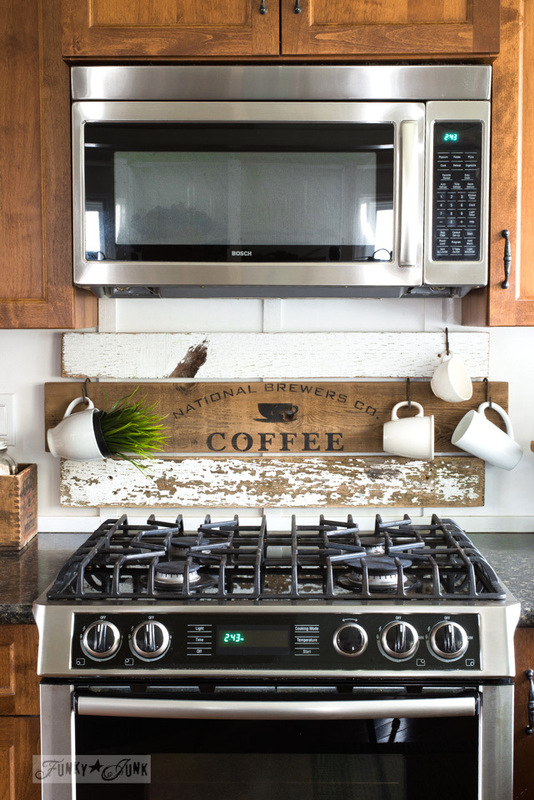 It looks terrific behind your stove and what a great way to make the most of your space! 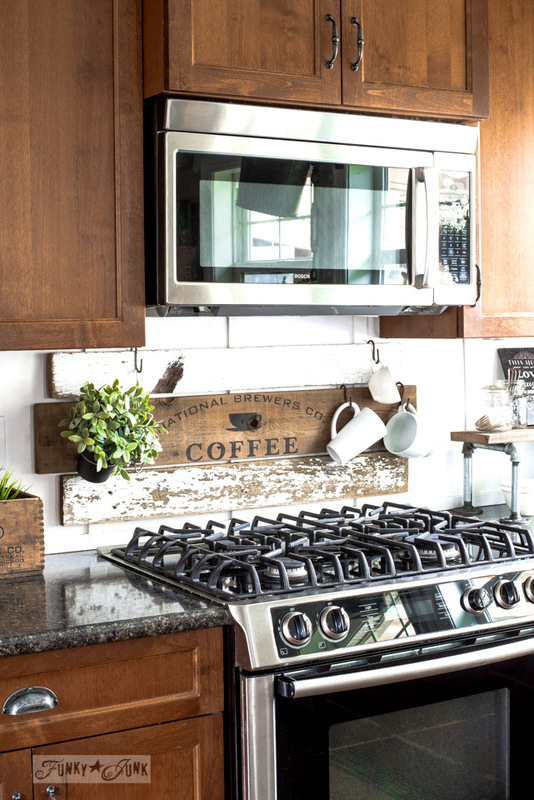 Always have loved your kitchen. There are certain details I especially am drawn to. The wood you put behind your stove. Love the look of it and would like to try it myself. I’ve read in past posts how you did it, and I must say I appreciate how your process is simple and doable. 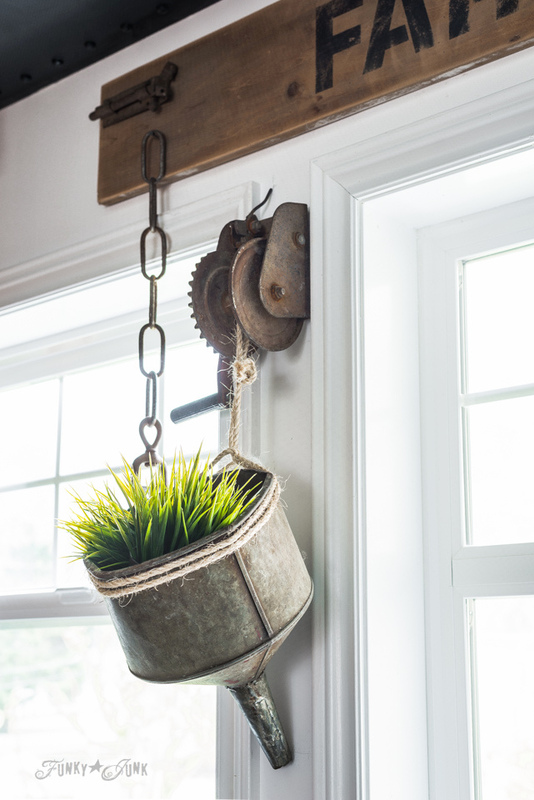 and I really like the metal pulley type contraption(forgive my description)by your window that holds plants. It’s awesome. And then my all-time favorite is the wall of windows. I love, love windows. Thanks for sharing Donna.